These days, foodie messiahs like Mark Bittman and Michael Pollan preach the gospel of whole foods and get quite a lot of ink and airtime for their ideas about a more healthy way of eating. But the most progressive idea in food from a hundred years ago would likely shock the slow fooders of today: the meal pill. Some of the earliest visions of the complete meal-in-a-pill can be traced back to the late 1800s, when first-wave feminists imagined that a nutritious, scientifically-concocted tablet could liberate women from the "drudgery of the kitchen." Over a century before the meal-replacement drink known as Soylent was finding traction on the crowdfunding sites of the 21st century, the idea of food efficiency was the promise of tomorrow. Despite our romanticization of food in the Good Ol' Days™ — this mythical period back when humans were supposedly more connected to the earth and "food was food" — preparing a meal was quite a chore. Baking a loaf of bread or making butter were not seen as a trendy lifestyle choice, but rather were back-breaking and tedious chores that required many hours of hard labor. 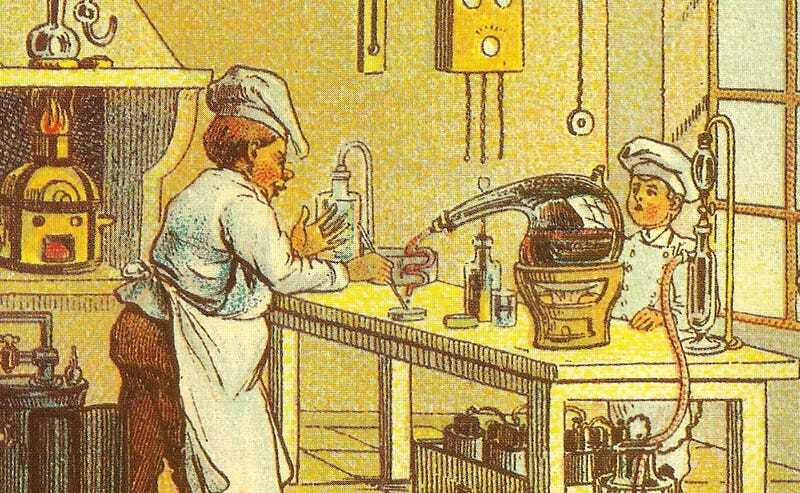 But much like the proponents of Soylent today, the feminists of the late 19th century saw science as the answer to their nutritional and social problems. Mary E. Lease was a suffragist from Kansas who in 1893 wrote about what the world of 1993 might look like. Lease saw the meal pill as a liberating force for the new American woman. Scientific advancement, she argued, would allow for more leisure time and let society progress into the egalitarian world that she had always imagined. The elimination of needless animal suffering would be a wonderful byproduct of these advancements on the farm and in the home. Lease, writing in the April 25, 1893 Newark Daily Advocate, thought that people of the future might live for days on a single pill! The stated goal of Soylent is improved efficiency. Who wants to go through all the trouble of cooking and chewing your food when you can simply drink a mixture of everything your body needs? Progressives at the turn of the 20th century believed this as well — and they thought this maximization of efficiency just might make the world a more equitable place. The meal pill came to be quite a symbol for conservative women too, though with more dystopian tones. To social conservatives of the late 19th century, the meal pill represented everything that was wrong with the feminist movement. In Anna Dodd's 1887 satricial novel about New York in 2050, The Republic of the Future, pneumatic tubes deliver prescription bottles of food tablets directly to kitchenless apartments. "When the last pie was made into the first pellet," Dodd's narrator explains, "women's true freedom began." It's hard to eat anything in the 21st century without it being a political and personal statement. Eating is such an intimate act; deciding what food to put inside your body is a strangely personal decision. However, the politics of food are not set in stone until the end of time. The ideas surrounding what futuristic food choices are progressive versus what's conservative have clearly changed quite a bit in the last hundred years. And with Malthusian ideas about population growth again in vogue, the meal capsule could easily become (yet again) the progressive meal of the future.